Is Guardians of the Galaxy Volume 2 as good as the first movie which was received so well? Overall I would say yes it is but I would give the first movie a slight edge. I say that mainly because everything the original movie had to offer was new, exciting and unlike any Marvel movie released to that point - and it delivered on all the promises seen in the trailers and then some. Volume 2 doesn't have the benefit of being completely new but it makes up for that with new characters, locations and the chance to dive deeper into existing and new character relationships. 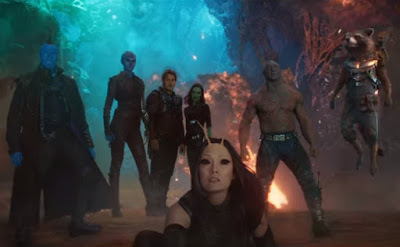 In particular we learn more about Peter Quill's backstory and the relationship between sisters, Gamora and Nebula. We also get some unexpected relationships that expand on Rocket and Drax's backstories too. 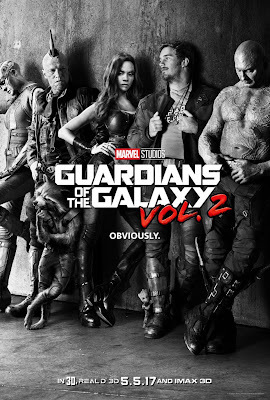 If you'e curious about why Yondu and Nebula are on the poster I've featured here, implying they're now members of the Guardians, you'll be pleased to know you'll get a better understanding of what drives these two characters as well. Baby Groot is probably the only character who we don't get to spend too much time with on fleshing out his backstory. However you won't mind because he gets plenty of screen time and is responsible for a fair bit of the humor in the film without being over used. The plot of this film is again exploring themes around family and what it means to be part of a family. This time the focus is on Peter's Dad who unexpectedly turns up near the beginning of the film. It's not really a spoiler knowing Kurt Russell is playing Ego, A.K.A. Peter's Dad, since this is revealed at the very beginning of the film. Now that I think about it much of the focus is around fathers in general... James Gunn has made a Father's Day movie! (You'll understand that more when you see how it ends along with one of the five credit sequences). I thought the first movie had a much more direct and easy to follow story line. Volume 2 kind of feels unfocused by the second act. I wasn't sure where they were going with it all, but the third act ties it all together in the end. I thought it was going to leave me disappointed with how all over the map the film seemed to get (literally and figuratively) but it all gets resolved in the end. The film is not without flaws but there's nothing so big it's going to ruin the movie. I found Drax's laugh beginning to grate early on because he seemed to laugh excessively at almost everything. However he settled down as the film went on. Ego's motivation seemed some-what sketchy to me as to why he wanted to do what he does. If you don't think about this too much though it's perfectly fine to just run with. As with the first film, Volume 2 includes plenty of action and space battles though the stakes don't feel quite as high this time around - despite the fact the team is literally trying to save the galaxy again. Overall, still a very fun movie. Well worth seeing on a big screen if you can (and I'm told it looks amazing in 3D too - though I haven't seen the 3D version). A third Guardians movie has already been confirmed. I hope James Gunn will finish strong with the team really working together a lot more than they did here. How many lessons about 'family' do we really need to learn?